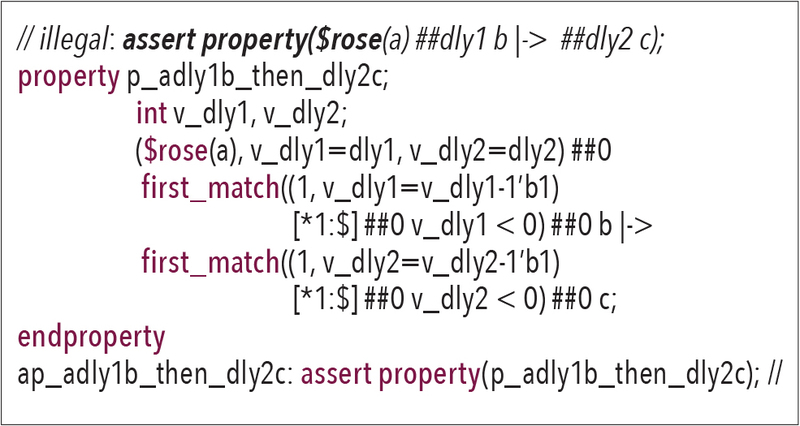 Assertion-based verification has been an integral part of modern-day design verification. Concurrent SVA is a powerful assertion language that expresses the definition of properties in a concise set of notations and rules; its use is very wide spread and is definitely encouraged. However, SVA is designed for a static world; it fails to easily address the use of delays and repetitions based on the values of unit variables (module, checker, interface); it cannot reference non-static class properties or methods; care should be taken when accessing large data structures, especially large dynamic data structures; sequence_match_item cannot directly modify unit variables; there are very strict rules on how property local variables are processed in the ORing and ANDing of sequences, and the flow through of those variables. It is important to note that those restrictions should not be viewed as a discount of SVA because SVA easily addresses most common cases of chip design requirements. In addition, the alternative presented in this article is only applicable for simulation, but definitely not for formal verification, as that is only supported by assertion languages (SVA, PSL). 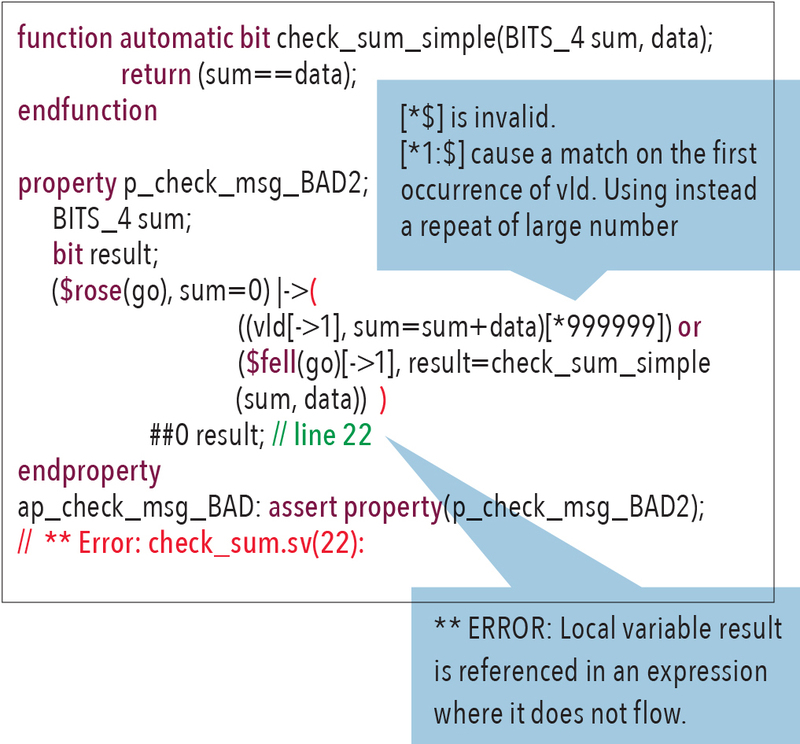 This article first explains the concepts, and then by example, how a relatively simple assertion can be written without SVA with the use of SystemVerilog tasks; this provides the basis for understanding the concepts of multithreading and exit of threads upon a condition, such as vacuity or an error in the assertion. The article then provides examples that demonstrate how some of the SVA limitations can be overcome with the use of tasks, but yet maintain the spirit (but not vendor’s implementations) of SVA. Another possibility to handle these issues is to use checker libraries such as OVL, Go2UVM2; those checkers are not addressed in this article. Again, it is important to emphasize that this alternate solution with tasks should only be used when those difficult situations arise. The property: The property describes the body of the requirements, but not its initiation for simulation. The property can be emulated with an automatic task that when triggered, starts an independent thread that can span over one or more cycles. 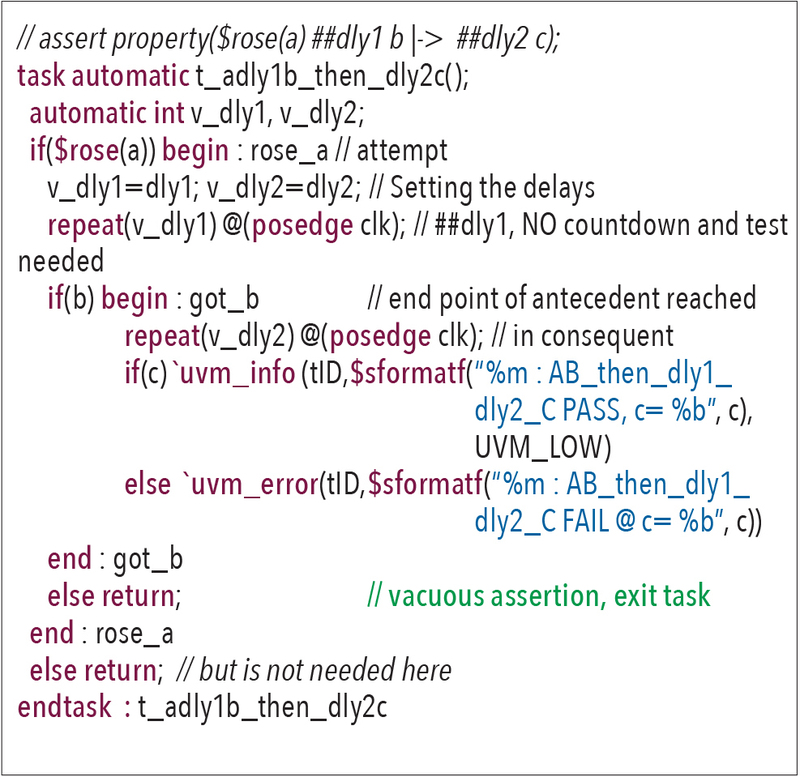 The assert statement: The assert statement is the mechanism that triggers the property at the clocking event. That action can be emulated with an always block that, at the clocking event, initiates the automatic task using the fork/join_none statement; this is more like a fire-and-forget of an automatic thread of the property from its starting (attempt) point. In modeling a property that contains an antecedent and a consequent, the task emulates the SVA antecedent with an if statement that represents the attempt phase, and a return statement to emulate an assertion vacuity when that if statement is false. If the if statement is true (i.e., successful attempt), then the task proceeds to emulate further sequence elements until it reaches the antecedent endpoint, but checking at each clocking event that the sequence is true. If it is false, a return statement emulates vacuity. What is desired in this assertion is having the delays be defined by dynamic values that are set in variables. SVA 1800’2017 does not allow delays or repeat operators to be defined dynamically, they must be static after elaboration. To circumvent this issue, SVA requires a convoluted counting method that does not clearly express the intent of the property, but is a workaround solution. In SVA, one must define in the property a set of local variables, then setting them up at the successful attempt, and then use those variables as counters. On top of these complexities, one must use in some cases the first_match() operator to forcibly end the count. Below is a possible solution, which looks rather complex. The above assertion is illegal because the range must be statically defined at elaboration. The following is a workaround. There are cases, such as in class monitors, where a set of concurrent assertions are useful because the data is available within those classes and in the interfaces (e.g., the virtual interface), but the verification occurs over a set of cycles. Concurrent assertions are illegal in classes. A workaround is to copy the class variables into the interfaces, and perform the assertions in those interfaces. However, the use of tasks alleviates this copying need. 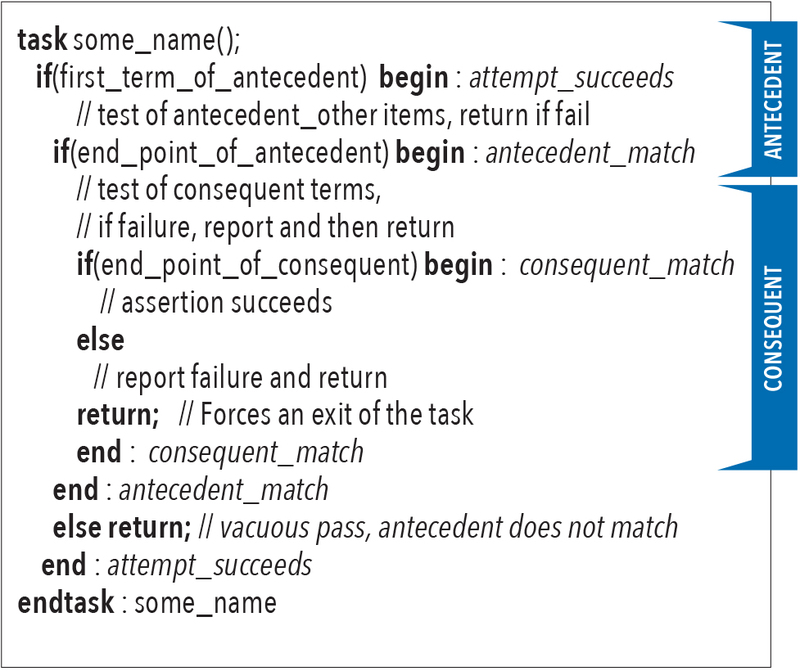 On the following page is a simple example that demonstrates the concept of how tasks can be used within classes to express concurrent assertions. Assertions that Appear OK but Are Not! The issue with this property is that the local variable result does not flow out of the ORing of the two sequences in the consequent; the code fails to compile. The above assertion tries to express that upon a rose of go, sum=0. 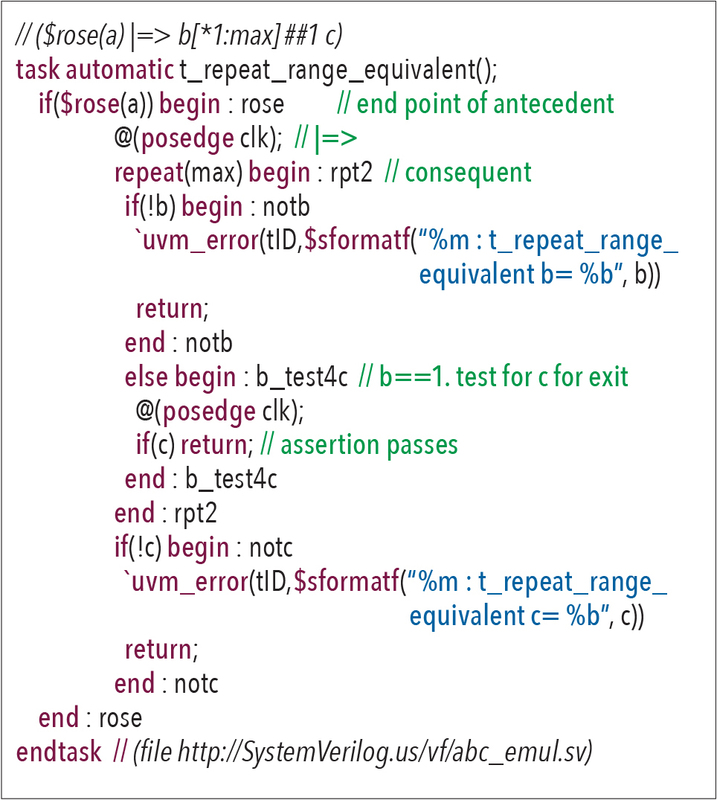 Then, at every clock cycle when vld==1, we compute the sum (local variable sum = sum+data). This process is repeated up to 100,000 times unless we get a fell of go, at which time we compare sum with the provided checksum from the data line. 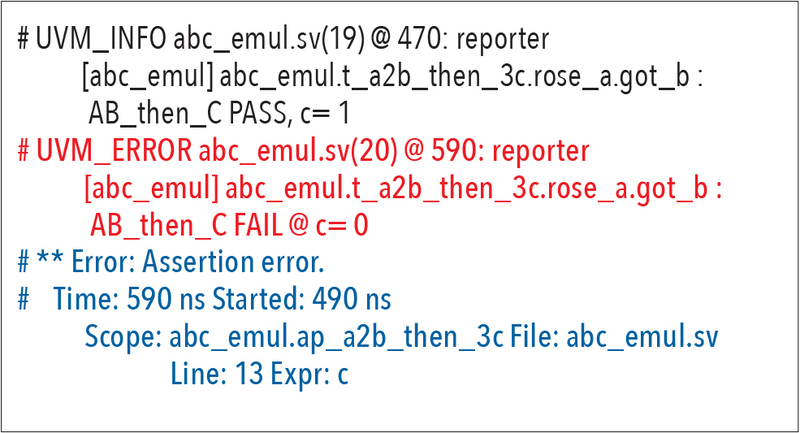 If there is a mismatch between the computed checksum and the provided checksum on the data line, the chek_sum function assigns a 0 to local variable result; this forces an assertion error, as it is the last term evaluated. The thinking here is that without this forcing of value, the SVA assertion will not exit as a failure. However, this is faulty logic because we have an ORing of two sequences in the consequent, and if one of those sequences fails, the assertion waits for a possibility that the second sequence may succeed with a match; thus it waits for 100,000 cycles. A potential solution to avoid this waiting for all possibilities is to use one of the SVA property abort operators (accept_on, reject_on, sync_accept_on, sync_reject_on). 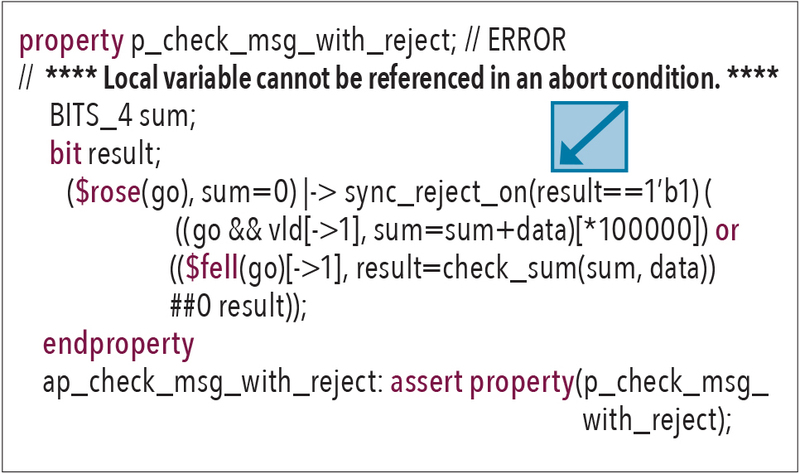 That solution fails to compile because local variables cannot be referenced in the abort condition. 1. 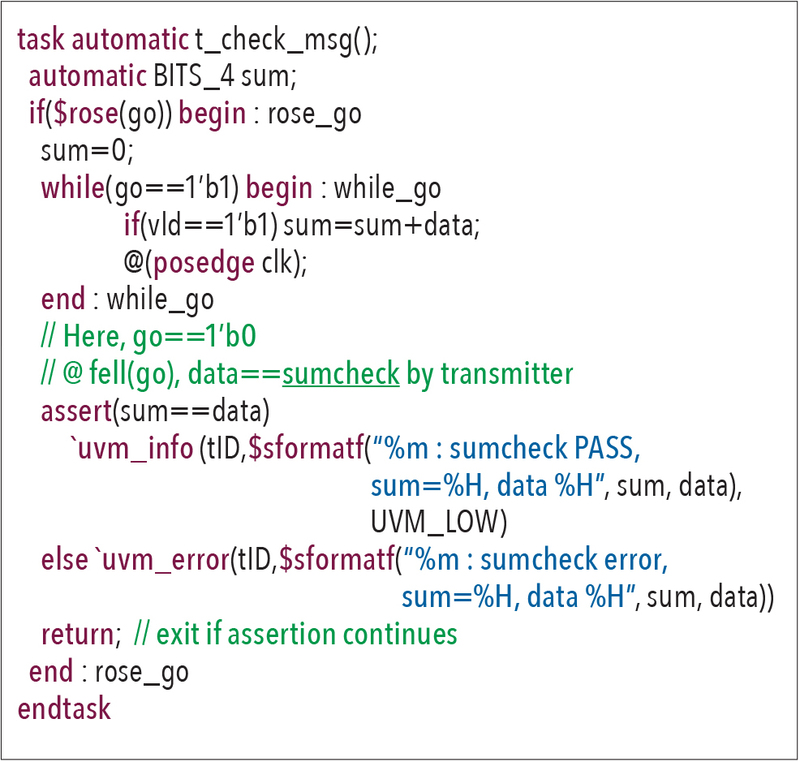 Assertion ap_check_msg_OK requires that upon a rose of go, a cheksum is calculated at every occurrence of vld. This operation is continued until the first occurrence of a fell of go (that is why the first_match operator is needed). 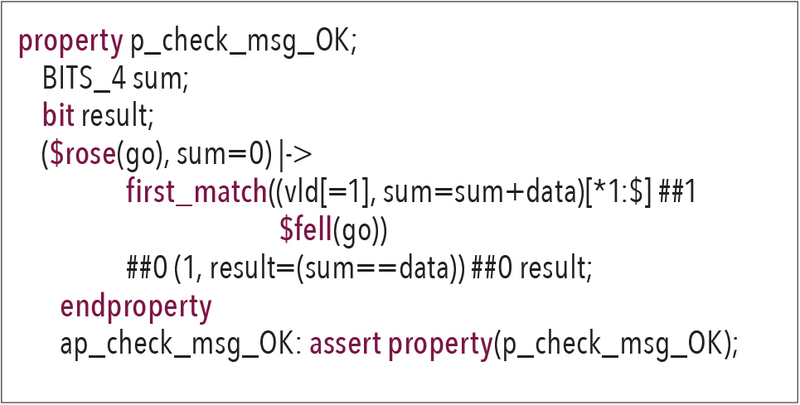 Thereafter a check is made to compare the presented checksum against what is dynamically calculated. Note that even though SVA does provide a clear solution, the above discussion emphasizes some of the restrictions that can cause misunderstandings. Concurrent SVA is very powerful language to express relatively straightforward properties in a concise and readable manner. 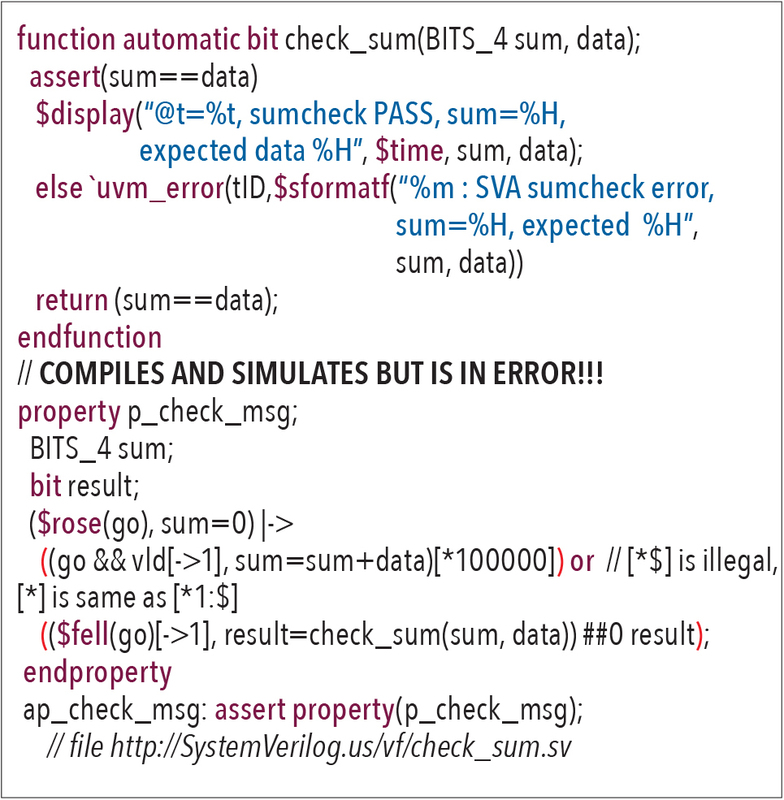 SVA is also well supported in formal verification. However, SVA has limitations that causes the use of less expressive options, such as counters, to circumvent the language restrictions. 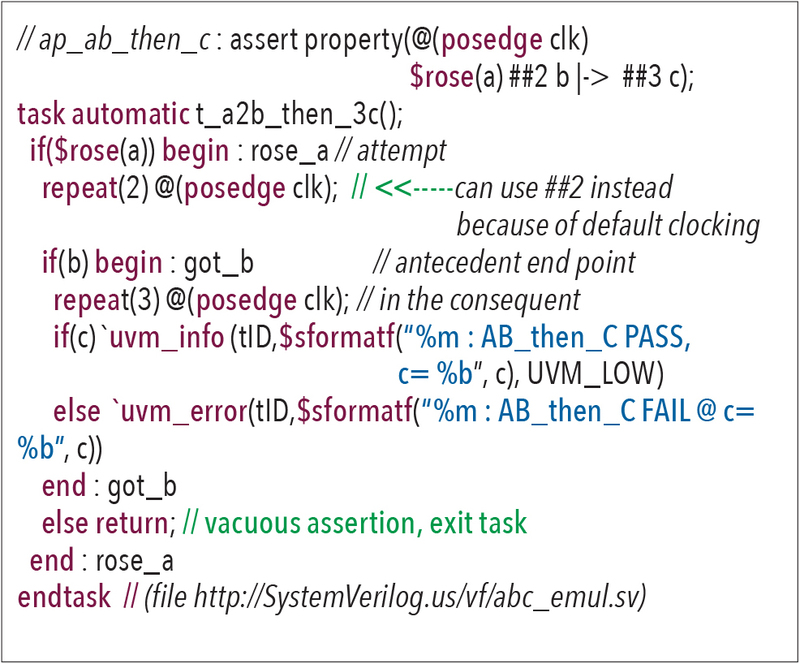 An alternative solution that emulates how SVA operates conceptually (but not in tool implementations) helps resolve those issues, and in some cases, simplify the definition of assertions. 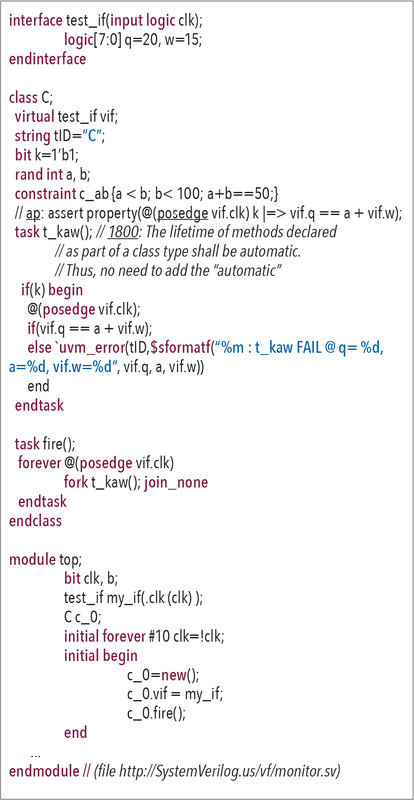 That solution relies on automatic tasks that are triggered at every clocking event, thus allowing the full use of all the features of SystemVerilog; these features include automatic variables, loops (e.g., repeat, forever, while, for), return, disable, fork-join, and immediate assertions. Keep in mind that an assertion is just a statement that a property is true, regardless of implementation. Thus, implementing an assertion with tasks is acceptable; SVA is just a shorter notation that adapts well for most cases, but not all cases. Acknowledgement: I thank my co-author Srinivasan Venkataramanan from verifworks for his valuable comments and expertise.